IowaBiz had an excellent post about how as a business owner, it can be incredibly frustrating when your employees always want a little more. Victor went on to suggest some ways that you can help your employees understand the investment you make in them. What a perfect segue to what I wanted to talk about today. Want to know how to create a workforce that appreciates you and all you do for them? Appreciate them first. It doesn’t have to be big bonuses or fancy prizes or trips. Most small businesses can’t afford that sort of lavish reward. So unfortunately, most of them decide to do nothing. Our building had an air conditioner and furnace go down a while back. Yes, when it was 90 degrees every day. The office itself wasn’t 90 degrees though. It cooled down to a balmy 87 degrees, if we had the fans going. Because we’d had a week of record temperature days, all the A/C companies were swamped. And our job wasn’t a small one. We’re talking a crane to get the A/C unit on the building etc. So, it took almost two weeks from the day the A/C went down until it was bearable in our office. And my team didn’t complain. Not once. They made sure the servers etc. were first in line for the fans, so we wouldn’t fry a computer. They tried to figure out how to stay cool and still get the job done. As the boss, I felt that they needed to know how much I appreciated their attitude during the heat wave. So I went to Dairy Queen and got everyone a $25 gift certificate with a note that said “thanks for keeping your cool!” Then, I went to Target and bought some silly sucker fans. 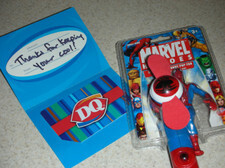 At our staff meeting, everyone walked into the conference room to find a fan/DQ gift card at each place. For about $30 I said thank you in a way that demonstrated that I had given some thought to how much I appreciated their efforts and wanted to do something special. How are you doing on saying thank you? And what is it costing you if you don’t? Drew McLellan gets branding and marketing and he really wants you to get it too. So for the past 20+ years, he’s told stories, asked questions, and milked sacred cows. All to help clients discover their brand so they can create authentic love affairs with their customers.Considered a national branding expert, Drew is a highly sought after speaker and has given about a zillion presentations at national conferences, key note addresses, training for his peers in the profession, college students and even his daughter’s tenth grade class.Over the years, Drew has lent his expertise to clients like Nabisco, IAMS pet foods, Kraft Foods, Meredith Publishing, John Deere, Iowa Health System, Make-A-Wish, University of Central Florida, SkiDoo and a wide array of others.Today, he and his agency work primarily with BtoB clients who recognize the power of knowing and living your own story. Thanks for sharing Drew, it doesn`t take tons of cash to make someones day. Also, just so you know Dell featured your post here. An excellent point. Not every workplace will allow even the smallest token type gift. It’s not the gift anyway — it is making the effort and taking the time. That’s what the employees notice and appreciate. A hand-written thank you note is a very personal and meaningful gesture that I am sure meant a great deal to those employees. No, it doesn’t. Bill’s example reminds us that it doesn’t take ANY money to say thank you. What it takes is something even more precious — our time. Good comments Drew. I might also add that a sincere, timely and specific “Thank you” has also proven to be very successful. Recognition is often just as powerful as reward. I recently worked at the Province of Ontario where even the small gift you suggested might be deemed “inappropriate”. So we developed a series of Thank You cards and encouraged Managers to write Thank You notes. We also had a monthly “MVP” program that was developed to recognized outstanding performance. The response to both were very positive. If anyone would like more info on either — let me know.